The Last Round depicts the last artillery round fired in the European Theatre of Operations at the close of the Second World War, 6 May 1945. A 155mm M1 howitzer is shown in full recoil, delivering a 96 pound projectile from a battery position in Germany across the Czechoslavakian border into enemy barracks in Volnay. 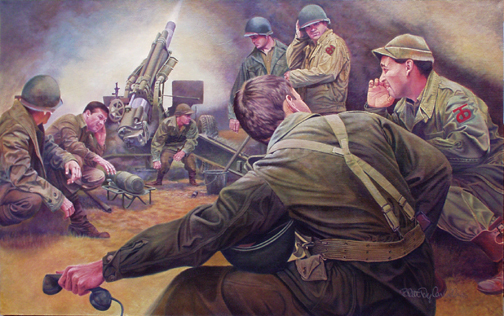 The original oil painting is in the permanent art collection of the Field Artillery Museum at Ft. Sill, Oklahoma. A full size reproduction hangs in the 90th Regional Support Command Headquarters in North Little Rock, Arkansas. The print is also in the private collections of President George W. Bush, Major General Toney Stricklin, former Commanding General of Ft. Sill, and Barker Hickox.